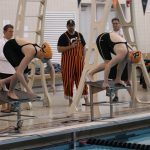 In a battle of area girls swimming and diving powers, defending Division 3 state champion East Grand Rapids held off defending Division 1 state champion at the 2017 West Michigan Relays Saturday. 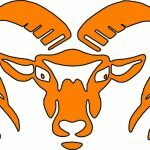 Trailing by 16 going into the last event, the host Rams needed a dominant finish to the meet and East Grand Rapids to stumble. Morgan Kraus, Sydney Seymour, Samantha Knepper and Peyton Rayburn powered home in the 200 freestyle relay, beating the field by more than two seconds (1:39.19). East Grand Rapids cruised home in second, clinching the title with 376 points. 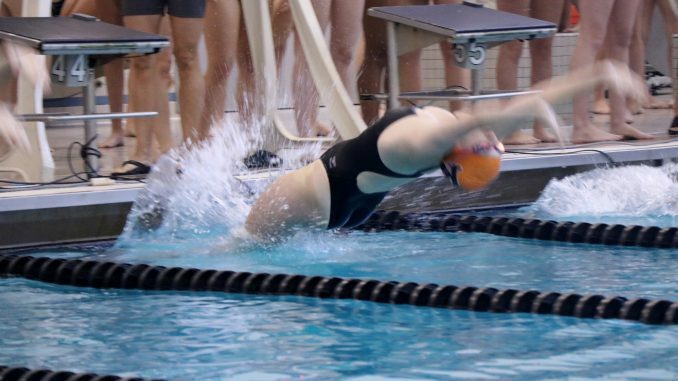 Rockford, which has now won three of the past five West Michigan Relays, totaled 366 points, while Holland West Ottawa finished third with 320 points. 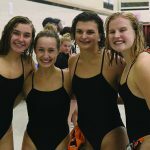 After Rockford placed fifth in the diving relay competition Friday, the Rams roared off to a good start Saturday by breaking their own West Michigan Relays record in the first event, the 400 medley relay. The new time of 3:56.60 set by Rachel Gamm, Masy Folcik, Kraus and Rayburn was more than two seconds better than the mark set by Kallen Wolfer, Sydney McDowell, Kraus and Meegan Snyman in 2016. 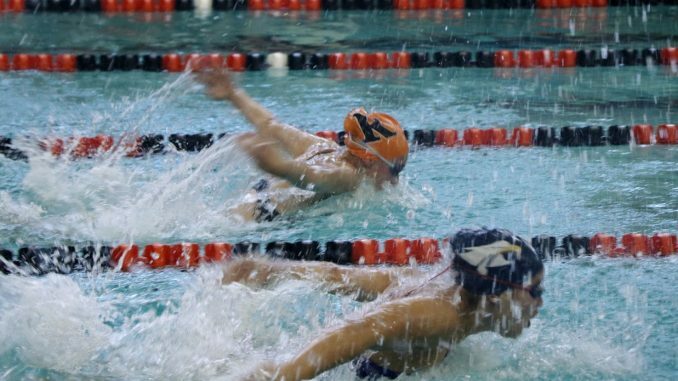 Rockford and East Grand Rapids stayed with reach of each other throughout the meet, each winning three of the 10 swimming events and each finishing second in four more. The schools combined to finish 1-2 in five of the 10 swimming events. Members of relay that set a meet record in the 400 medley relay. From left, Masy Folcik, Peyton Rayburn, Rachel Gamm and Masy Folcik. 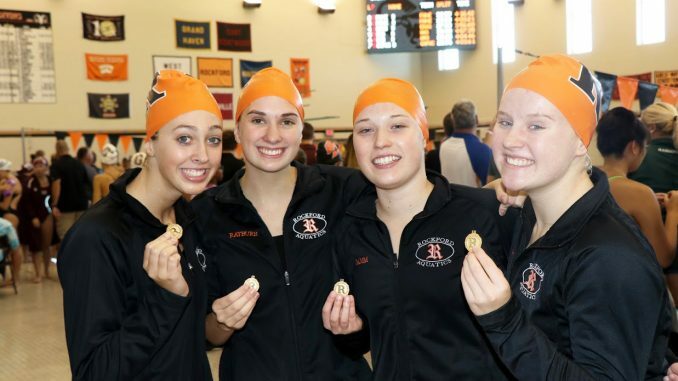 Rockford also set a new meet record in the 200 butterfly relay, with Rachel Gamm, Ashley Duimstra, Knepper and Kraus posting a time of 1:47.83, beating Rockford’s record of 1:48.16 set last year (Duimstra, Wolfer, Gamm, Kraus). Catholic Central, which finished 10th, visits the Rams Thursday at 6 p.m. for Rockford’s next meet.